The compact, portable TM-2441 is also excellent for spot measurement in wards. The multisensor allows temperature, pressure and activity to be measured simultaneously with ABPM measurement. This data is useful for analyzing the influence of the external environment on BP variability. IHB mode records detection of irregular heartbeats.2 Effectiveness has demonstrated by verification of AF screening for arrhythmia.3 The software that comes with the TM-2441 can analyze waveforms produced during measurement and easily determine blood pressure values. OLED display: This display indicates ABPM behavior during use. You can confirm the ABPM measurement value and mode as well as the state of the battery, Bluetooth and memory. LED display: This large display shows data from measurements in self-measurement mode. 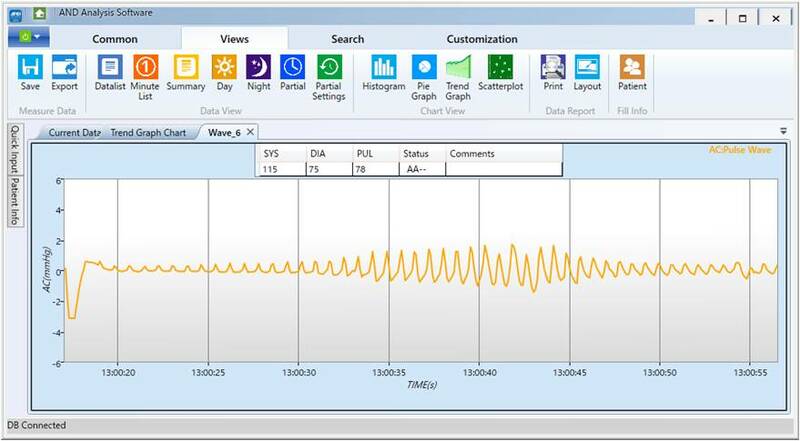 You can easily check the time until the next ABPM measurement in addition to values in self-measurement mode. There are also icons for battery level, Bluetooth status, IHB detection, clock, mode and memory status. 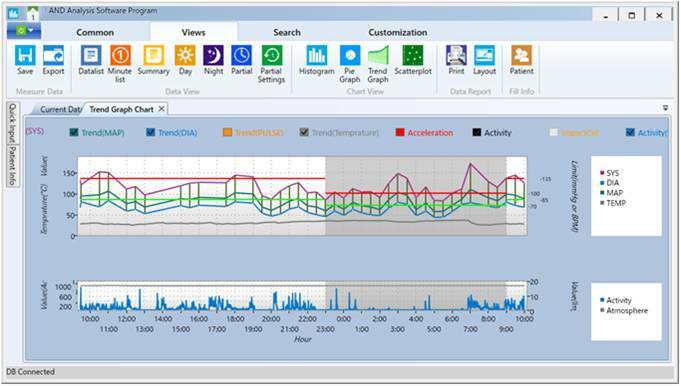 The newly designed software can analyze environmental data collected by the multisensor in addition to ABPM measurement data. 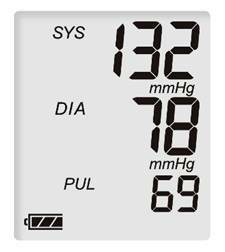 Temperature, pressure and activity can be graphed alongside blood pressure. *The IHB detection function uses an algorithm for detecting pulse fluctuations. The I.H.B mark may display due to body movement not caused by arrhythmia. Kazuomi Kario et al., Development of a New ICT-Based Multisensor Blood Pressure Monitoring System for Use in Hemodynamic Biomarker-Initiated Anticipation Medicine for Cardiovascular Disease: The National IMPACT Program Project. Send to Prog Cardiovasc Dis. 2017 Nov - Dec;60(3):435-449. Measurement count 200 times or more. It varies due to measurement conditions. Interface USB : USB1.1 compliant. Cable length : 1.5 m or shorter. Micro-USB B type terminal can connect to dedicated peripheral (using standard driver software). Bluetooth Ver.4.1 (BLE) Wireless device can be connected.